The California Department of Water Resources conducted the first manual snow survey of the year. The good news is that we have more snow than we did last year. The bad news is that the snow water content is still about 43% of the historical average for this time of year. 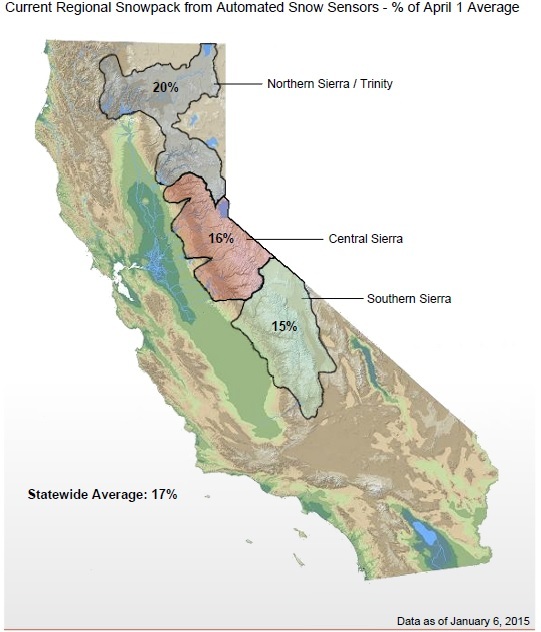 Looking at it another way, the snow water content state-wide is 17% of the historical average on April 1st, when the snowpack typically peaks. On April 1st last year, the snowpack was about 32% of the historical average. Manual snow surveys are conducted around the 1st of every month, starting in January and ending in May. By the end of the season, more than 300 snow courses will be sampled at least once. The state also has about 105 electronic sensors that provide real-time estimates of snow water content. This month, Cambria will begin operation of a new desalination plant. The project, proposed in May, had been fast-tracked as a result of the drought and with the help of Governor Brown’s drought declaration. In 2014, CAL FIRE responded to 5,620 wildfires across the state, which burned 90,606 acres in State Responsibility Areas (SRA), areas where CAL FIRE has jurisdiction. These figures are higher than the average 4,681 wildfires on 88,169 acres of SRA land. 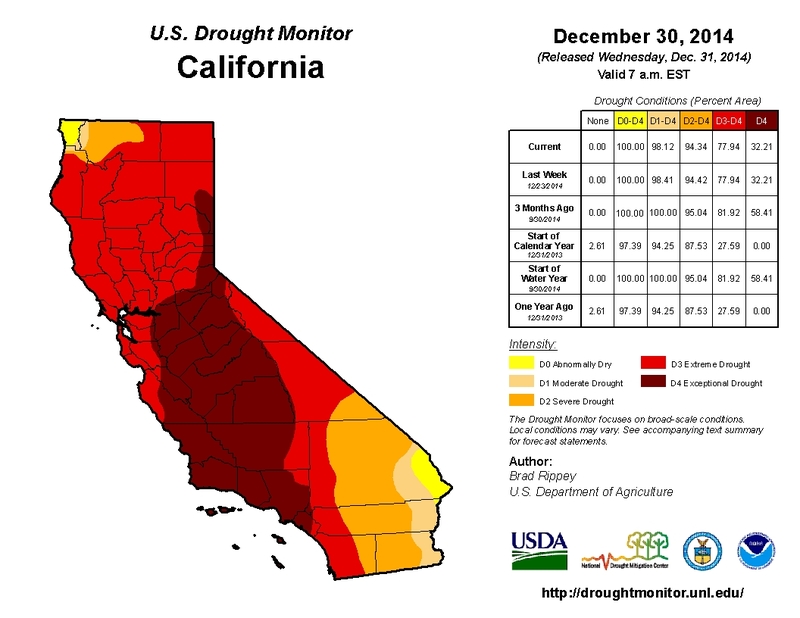 Drought conditions have not changed from two weeks ago. While average precipitation is still up for this water year (which starts on October 1st), average precipitation has been below normal for the past two weeks. 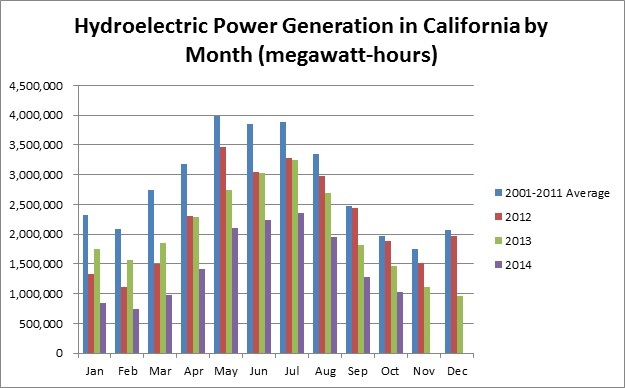 The U.S. Energy Information Administration released the Electric Power Monthly report for October. 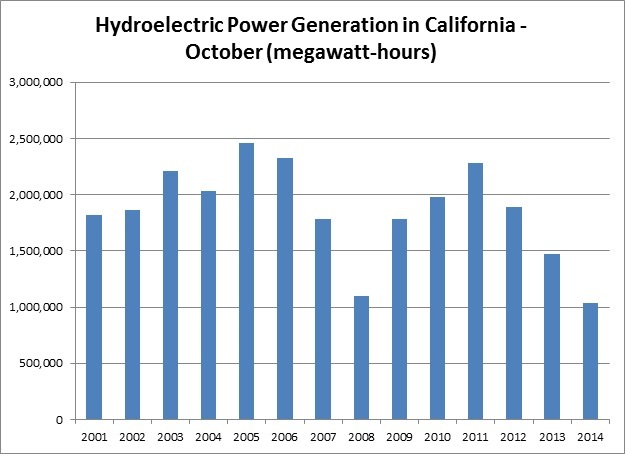 October generation was 70% of last year and 53% of the 2001-2011 average. 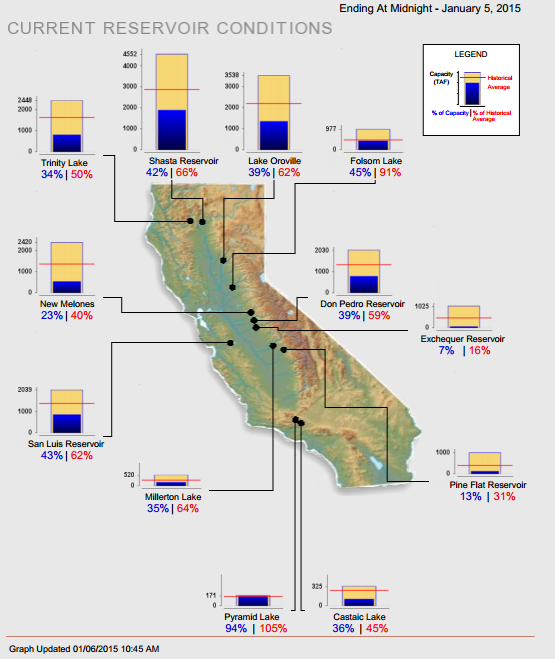 Statewide, California’s major reservoirs (representing 27.3 acre-feet of storage) are at 37% of capacity and 62% of normal.